Is TiVo a Good Alternative to Your Cable DVR? What Is TiVo and What Can It Do? TiVo is one of the original digital video recorders (DVRs). It's both a set-top box and a service. As the focal point of the digital living room, TiVo puts convenience and control into the hands of consumers. It's hailed for its ability to enable viewers to pause live TV and record programs to watch on their own schedule. It works in conjunction with your cable subscription. Many consumers find that it remains a great value and alternative to the DVR services offered by cable companies. TiVo was one of the first companies to introduce us to DVR technology, the ability to record TV and watch it whenever we want. The company launched in the late 1990s and quickly became a household name. Television options have progressed tremendously since TiVo first appeared on the market. Though TiVo has many more competitors than it once did, it remains a popular option for many consumers. The company continues to keep up with the latest technology. It has improved its DVR boxes over time by adding options like streaming and integration with popular apps. The price for the service is also competitive and many customers feel that it is a better deal than DVR add-ons offered by their cable provider. TiVo offers a few set-top boxes for customers. The primary option is the Bolt Vox which is available in two models that differ based on the number of tuners and storage the device has. The 3 TB Bolt Vox has six tuners, allowing you to record up to six shows at one time. This amount of storage is enough for 450 hours of HD content. The other two options for the Bolt Vox both have four tuners and can record up to four shows at once. This model is available in 500 GB and 1 TB capacities, allowing storage for 75–150 hours of HD content. The Romaio OTA has four tuners and allows you to record over-the-air (OTA) broadcasts. With 1 TB of storage and many of the features of the Bolt, this is a perfect solution for cord cutters who use an HD antenna for local channels. 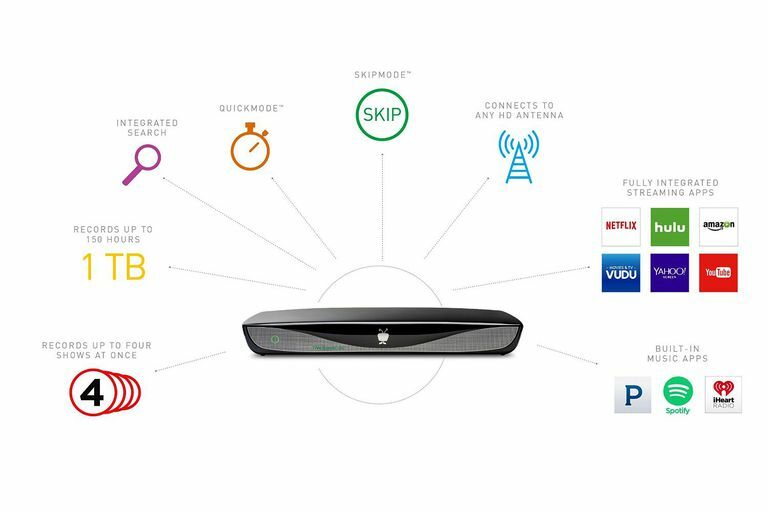 If you want TiVo service on more than one TV in your home, the TiVo Mini VOX is available. Attaching one of these mini boxes does not add to your monthly service plan. The Mini VOX can connect with the Bolt, Bolt+, Bolt VOX, Roamio OTA, Roamio Plus, and Roamio Pro. Integrates with your cable subscription for live TV, giving you the ability to pause, rewind, and record shows and movies as well as schedule recordings. Streams content on iOS (iPhone and iPad) and Android mobile devices so you can watch TV wherever you are. Integrated with popular streaming apps like Netflix, Hulu, Amazon, and more. Includes the ability to access your Plex account for photos, music, and videos uploaded to that service. There are also a few features that users enjoy about the TiVo platform as a whole, regardless of the plan they buy. You can skip an entire set of commercials with one button. Speed watching for those slow-moving sports, news, and other broadcasts that you can't miss but don't have the time to watch in their entirety. Compatibility with 4K UHD setups. The search function scans both broadcast TV and streaming services at one time. Is TiVo Right for You? There are many factors that should go into your decision on whether or not adding TiVo to your home entertainment center is a good choice. For the most part, you want to compare it to the options offered by your cable company and how that cost compares to the TiVo service. Unlike most cable subscriptions, you will need to purchase the TiVo DVR box outright. Depending on the model, you will spend $200–500 (there are factory-renewed boxes available from the company). Compare this against the rental fees associated with your cable-provided DVR box. In the same way, TiVo requires a monthly subscription for the service to stay active. This cost is around $15 and there is a price break for an annual subscription or a lifetime subscription. You might also find that one year of service is included with a new box. Again, comparing this with the service charges from your cable company and factoring in the features of each service will give you a better idea if TiVo is a good value for you. It's also important to know that TiVo doesn't work with satellite or analog signals. To get the most out of TiVo, a digital cable subscription or HD antenna is necessary. Overall, for many TV watchers that want the latest options, TiVo can be a great deal. The company has stayed at the forefront of the new television era and it's likely that they will continue to bring customers the best and newest features as technology advances.